Przybylski’s Star I: What’s that? OK, a new slow blogging. This one in three parts. Przybylski’s Star is my favorite astrophysical enigma (this coming from the guy notorious for making Tabby’s Star famous!) It is occasionally mentioned as a SETI target, but usually in private conversations or irreverent asides on social media. I’m not sure when I first heard about it, but it may have been when looking at the Wikipedia page for stars named after people while doing research for that other star. Przybylski’s Star is famous for having bizarre abundance patterns. Not like: “oh look, the carbon-to-oxygen ratio is greater than one”; more like this star has more praseodymium than iron. Yeah. How could that be?! Normally, A stars are pretty boring, spectrally. Cool stars, like the sun, a G star, have convecting envelopes (and atmospheres) like a boiling pot of water; this drives a magnetic dynamo that gives the Sun and other cool stars their magnetic fields. Hot stars (spectral types mid-F and hotter, including A stars) have radiative envelopes, meaning that most of the outer layers are very still, like the water in a bathtub left untouched for days. This means no dynamo. Apparently, this figure from the Wikipedia page for magnetic braking of stars is supposed to illustrate how it works. As stars form from collapsing clouds of gas, they spin up, going faster and faster. When they finally “turn on” they can be spinning so fast they they are near break-up speed: the centrifugal force of the spinning is enough to make them oblate. 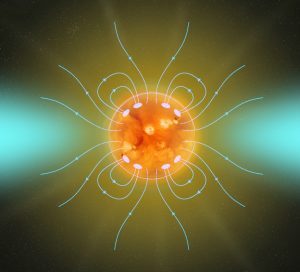 Cool stars have magnetic fields, and as the star’s ionized outer atmosphere escapes in a wind, the wind particles get stuck on these field lines and fly down them like beads on a spinning wire. The fields, being anchored to the star’s surface, impart some of the star’s angular momentum onto the particles, and the star slows down ever so slowly. Over billions of years, the star spins down to rotation speeds of more like once per month. But Ap stars break all the rules. They have intensely strong magnetic fields, and as a result they don’t rotate fast (presumably having slowed down long ago), and as a result they have very narrow lines, and as a result you can see all of the spectral features of the elements in their atmosphere. Why? I’ve never seen a good answer as to why Ap stars have strong fields. They could be primordial or generated from a dynamo, says Wikipedia, which is fine but misses the weird part: regardless of where the field comes from, why do only a minority of A stars have such fields? What’s different about them? And here’s the even weirder thing: the abundances of the elements that we get to see thanks to the slow rotation are way off of the abundance patterns we see elsewhere in the universe. Why? Next time, I’ll discuss likely answers, and then get to the weirdest member of this already weird class: Przybylski’s Star. 1Apparently the initial “P” is not completely silent, but it’s so subtle that to untrained US/UK ears it might as well be. I think it’s roughly approximated by having your lips closed when you start the “sh”: the slight plosive as your lips pop open is all it takes, as in the interjection “pshaw“. It’s not “puh-shi-BILL-skee”. Thanks Andrew Przybylski‏ (@ShuhBillSkee) and Jackie Monkiewicz (@jmonkiew) for setting me straight. This entry was posted in science, Uncategorized and tagged science on March 15, 2017 by jtw13. Has the possibility that Przybylski’s star passed through a kilonova remnant within the past few hundred years been dismissed as impossible? With its 9300 yr half-life, 80% spontaneous fission branch ratio, and probable initial concentration comparable to uranium 238; curium 250 can account for fission products in the star’s atmosphere all by itself. Such a star-remnant collision is the simplest explanation for the star’s unusual atmospheric composition.